We'd fill our tricycle basket or our stroller storage with pinceones every time we went out for a walk or a run. My kids were getting pretty good at identifying trees that they knew would have the right kind of pinecone. Then, when we got home, we'd unload them into a box we kept in the garage. Until one day, we decided we had enough and it was time to make our wreath. Lucky for me, I had recently made a trip to a thrift store and found two straw wreath forms for only 50 cents a piece! Sweet deal. So, I whipped out one of those straw wreaths, my hot glue gun and my 3-year-old and I went to town. She had the important job of choosing which pinecone went on next while I used the hot glue gun to adhere them to the wreath. We tried a few times to have her stick on a pinecone, but frankly I could tell that was going to end in hot glue-on-the-skin for sure, so we bagged that plan. For the most part, I put the largest pinecones on first and then smaller ones on top. I was tempted to do what this gal did and spray paint a fine misting of paint on some of the pinecones. Some with a dash of gold, others with silver, and some with green. I really like the way it looks. However, as I was standing in the store, holding the 3 cans of spray paint, I realized that suddenly my 50 cent wreath was going to cost about $15. And while I liked the effect the paint had on the wreath, I didn't like it THAT much. I mean, it's just plain hard to beat 50 cents! 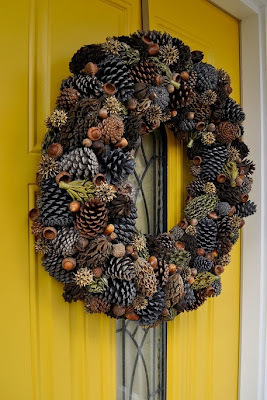 So, plain, natural, outdoorsy, full-of-fall pinecones it is. And I love how it turned out. Easy, inexpensive, and seasonal. What's not to love? Your wreath is really pretty, Jaime. What fun for you and your munchkin!